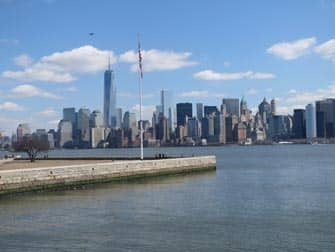 Ellis Island is known to many as the island of immigration; here millions of immigrants were granted entrance to the United States to fulfil their dreams. After all, America was the land of the free and home of the brave. Everyone could obtain the American Dream, something that wasn’t possible in their own countries. What some might not know is that Ellis Island was only opened and used as a gateway for immigration in 1892. Up until then, for around 35 years, the New York State officials at Castle Garden Immigration Depot in Lower Manhattan was used to process over eight million immigrants. When Ellis Island opened, 700 immigrants passed – the first being 15-year-old Annie Moore. When immigrants arrived, they were given a brief medical exam (to determine whether or not they could enter) and asked a number of questions. Around 2 percent were not granted entrance due to medical or other reasons, and for these the island is also known as The Island of Tears. The name of the island comes from Samuel Ellis who bought the island in 1785. It was surrendered to the United States in 1808. Until 1814 it was a federal arsenal when it became military post for almost 80 years. Today, Ellis Island is federal property but falls within the state of New York and the state of New Jersey. In fact, it is actually located within Jersey City. There is a little history, and a lot of bureaucracy involved in the reasons behind this. 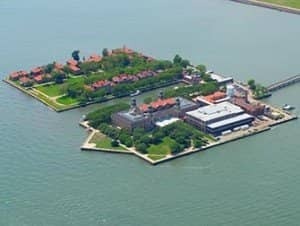 Ellis Island, (together with Liberty Island and Black Tom) were once called the Oyster Islands due to the vast amount of oyster beds that surrounded the islands. For three centuries, the Oyster Islands would be the main source of oysters until land-filling largely destroyed the beds. The landfill was exactly what sparked disputes over the state sovereignty. The Supreme Court ruled only in 1998 that most of the island created artificially belonged to New Jersey, whereas the originally island (around 20%) belonged to the state of New York. This means that there are parts of the island that are in New York, and parts in New Jersey. When visiting, this doesn’t make a difference as both states have joint jurisdiction. Ellis Island does have an ‘address’ though: Manhattan Block 1, Lot 201. In 1965, Ellis Island was made part of the Statue of Liberty National Monument. An immigration museum was opened in 1990, housing documents after the summer of 1887 as those before were destroyed in a fire. 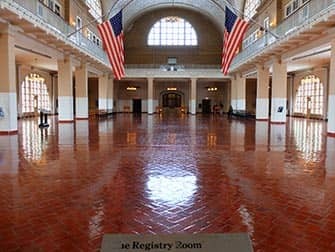 Eric’s Tip: In the Ellis Island Museum there are computers where everyone can search the immigration archives. Did you develop a curiosity during your visit? 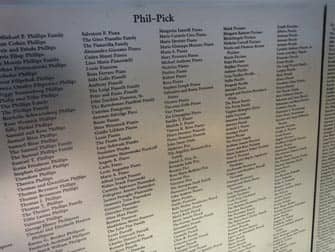 Could you have ancestors who entered the USA via Ellis Island? Search your surname and, who knows, maybe you’ll find a match. How to get to Ellis Island? 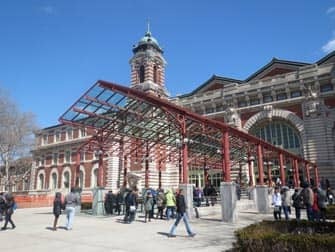 Ellis Island is only accessible by ferry. Ferries depart from Battery Park and make a loop, first stopping at the Statue of Liberty. The ferries depart every 40 minutes but are very popular. 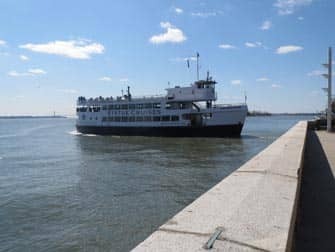 Tickets for this ferry are included in the New York CityPASS, the New York Pass as well as the Explorer Pass. 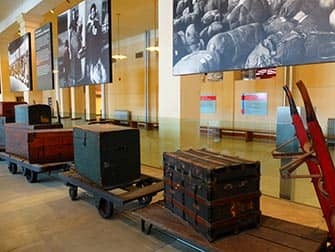 If you want to skip the queue, and learn more about Ellis Island and Lady Liberty, then take the Skip the Line Walking Tour. Not only will you be able to skip the (often very long) line, the knowledgeable guide will tell you a lot about the history of both islands.